Published: Dec. 16, 2018 at 02:21 p.m.
Oakland Raiders quarterback Derek Carr fools the Cincinnati Bengals defense with a 1-yard touchdown pass to tight end Lee Smith. 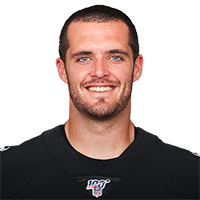 Oakland Raiders quarterback Derek Carr shows unreal accuracy on a 39-yard throw to wide receiver Seth Roberts late in the fourth quarter of a Week 14 matchup against the Pittsburgh Steelers. Published: Dec. 9, 2018 at 07:33 p.m.
Oakland Raiders quarterback Derek Carr finds tight end Derek Carrier for a 6-yard touchdown to take a late lead. Published: Dec. 9, 2018 at 07:10 p.m.
Oakland Raiders quarterback Derek Carr finds tight end Lee Smith for a 3-yard touchdown.